The human population is now close to 6.5 billion. But you are the only one like you, your genetic makeup is unique and that is why you are unique. There is no substitute or replacement. You are unique and precious in this world. Think of this amazing diversity within human population. But the fact is we are 99.99% similar in genetic makeup according to human genome project. This diversity is contributed by just 0.01% of the genome. How is it possible to have this much diverse manifestations with 0.01% of genome? Actually we don’t know exactly. Now we will discuss what we know about this mystery. One of the reasons for this genetic mix up or uniqueness is by a process called crossing over that occurs during meiosis. The second process of meiosis that contributes to genetic variation is the random distribution of chromosome in anaphase I of meiosis following their random alignment in metaphase plate. We will discuss crossing over in this post. Crossing over is the exchange of segments between the non-sister chromatids of homologous chromosome. Don’t confuse this term with translocation. Translocation is the movement of segments between non-homologous chromosomes or region of the same chromosome. An example may fix the issue. Philadelphia chromosome; a chromosome formed due to reciprocal translocation between chromosome 9 and 22. A portion of chromosome 9 translocated to chromosome 22 that is between two different chromosomes. This is translocation. O.K. Fine. The term crossing over was coined by Morgan. Crossing over can even occur in somatic cells. Somatic crossing over is rare and has no significance. Somatic crossing over is reported in Drosophila by Curt Stern (1935). Now moving into the detail of meiotic crossing over or germinal crossing over; this type of crossing over takes place in germinal cells during gametogenesis. This process is universal in occurrence and has great significance as we discussed in the introductory paragraph. Crossing over is a crucial process that generates genetic difference within a population. The prerequisites for crossing over are firstly, 99.7% of DNA replication and 75% of histone synthesis must occur by prophase I. Secondly, each chromosome must attach by its telomeres (ends of the chromosome) to the nuclear envelope through specialized structures called attachment plaques. Synapsis is the intimate pairing between the two homologous chromosomes. It is initiated during the zygotene stages of prophase I of meiosis I. Here chromosomes are aligned side by side and each gene has its counterpart aligned perfectly (gene for gene alignment). The resultant pairs of homologous chromosomes are called bi-valents. Synapsis is followed by duplication of chromosome (in pachytene). Sister chromatids are held at centromere. At this stage, each bi-valent has four chromatids now called as tetrad. Crossing over or exchange of segments between the non-sister chromatids of homologous chromosome occurs at the tetrad stage. Homologous chromosome may stay in synapsis for even days during pachytene stage. Now let us have a look into the details of crossing over. Which are the enzymes involved in crossing over? Endonuclease is responsible for breakage of 2 non-sister chromatids at corresponding sites. This is followed by the exchange of segments and finally the exchanged segments are joined or the gap is filled by ligase enzyme. Crossing over takes place at several points on a tetrad and result in several chiasmata. These are regions were chromosomes are held together. Larger the chromosome size the more the number of chiasmata. Frequency of crossing over is dependent on the physical distance between genes on the chromosome. The chance of crossing over is more for distantly located genes. The final step is terminalisation. After crossing over the non-sister chromatids starts to repel each other. During diplotene, Synaptonemal complex dissolves and desynapsis takes place. During diakinesis, chromosome detaches from the nuclear envelope and the chromatids separates progressively from the centromere towards the chiasmata. Meanwhile chiasma itself moves in a zipper fashion towards the end of tetrad. This movement of chiasma is known as terminalisation. 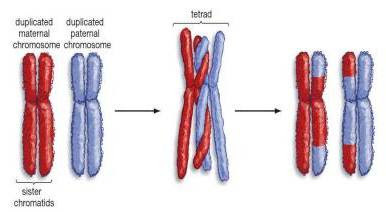 As a result of terminalisation, homologous chromosomes are separated completely.